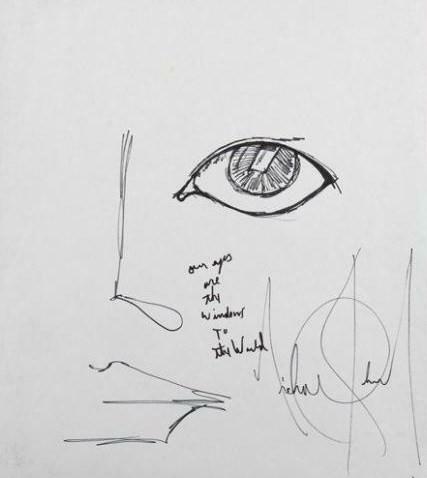 This quote from Michael are the only words I remember vividly after watching the Bashir documentary, he pointed to his eyes while saying it and I felt in my bones that he meant it. Michael knew that to make his children or anyone understand how he felt about them he had to look them right in their eyes. Even Rabbi Shmuley understood this and speaks about how Michael taught him this beautiful way of speaking to others. I believe this is a lost art of communication and I try to use it with people every day. I felt compelled to write this post because I find it disturbing how the social media is taking a turn for the worse and is plummeting deeper and deeper into utter disregard for humanity and degradation of others. I am not a perfect person and lose my cool often, but I attempt to never let my mouth open until I have taken a few breaths and think what I am going to say before I regret it and loose total control, if I don’t I may be hurting myself more than I hurt others. In the past few days I have seen just what can occur when people do lose control and when it does happen it can be very ugly. It is happening within the social media every day whether it be you tube, twitter, Facebook, blog posts, articles, radio shows, etc. Just recently in the city of Toronto a you tube video went viral when one “young man” and I use those words loosely, was recorded urinating on the face of a homeless man while he was passed out or asleep. You could hear laughter by the people passing by as well as the person recording the incident on a cellphone. It was brought to the police’s attention and this individual is being sought, one of the small clues they have is the man urinating held a specific religious pamphlet in his hand with his back to the camera, ironic as it seems this may be his downfall. The police officer responsible for this case said it was the most degrading thing he had seen done to another human being for “kicks” in a long time and if and when he is found he will be arrested. I ask, is this what our society has become? Social media has replaced one to one conversations and even confrontations, and in doing so people have lost total respect for one another. It is a lot easier to curse and degrade people behind computers and with our backs turned to cameras than it is directly looking into one’s eyes. Where is the compassion for our fellow human beings? I think it has been lost on our fingertips. Would people do these things and make such vulgar remarks to each other if they stood right in front of them? Perhaps, but I think it would be a lot harder to spew horrific words when and if tears are pouring from the recipients eyes. It is a I’m sure a frustrated and hurt heart that we cannot see behind these keyboards (both the person spewing unkind words and the recipients) and I for one, find it unfathomable that people can be so cruel. I have seen and read more curse words on twitter and FB than I ever care to see again. It is a sad state we are in if this is the way people of all ages speak to one another, whether they be friends or not, with humour or not, they are unkind and cruel, we are all here living on this planet together and when our time comes to leave it will we be able to say “I never degraded myself or anyone else?” after what I have seen, I think not. SGAA is an advocate for the abuse that happens on the airwaves, It is a blog with followers that are very kind. However vile names and comments have been left by people just because they do not agree with a post. This group has been called a “Sony plant” by people who know nothing about what SGAA represents and all because of opinions. Every one is entitled to their opinion and free speech is a gift to that we all have and cherish. One can only pray that most of us use it wisely and that we express everything we need to say with “L.O.V.E.” and kindness. If not, life will be a long and lonely path for each of us.